Dental laboratory sandblasters are used to increase bond strength by divesting the casting investment and increasing effective surface area as well as polishing the surface of castings. Sandblasters that are used in dental laboratories are enclosed and often operate through a vacuum or via air compressor. Dental laboratory sandblasters are operated via foot pedal and often feature gloves to work through, this keeps everything contained. Sandblasting media can be Aluminum Oxide, glass beads or Silicone Carbide grit. 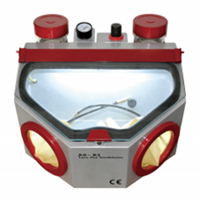 Be sure to choose a dental laboratory sandblaster that employs proper dust retraction. Dental sandblasters can also be intraoral and used in dental operatories. Also referred to as air abrasion, dental sandblasters can be used instead of dental drills in various procedures. Intraoral dental sandblasters have a variety of angled tips allowing the technician to reach any part of the mouth. These tips should be autoclavable. Be sure that if a product is used intraorally, that it is FDA approved.